Ted Eldon Edwards, son of Thomas Roy Edwards and Vera Navelle Aycock, married Midred Hortense Horton and buried in Cook-Walden Capital Parks Cemetery and Mausoleum, Austin, Travis County, Texas. 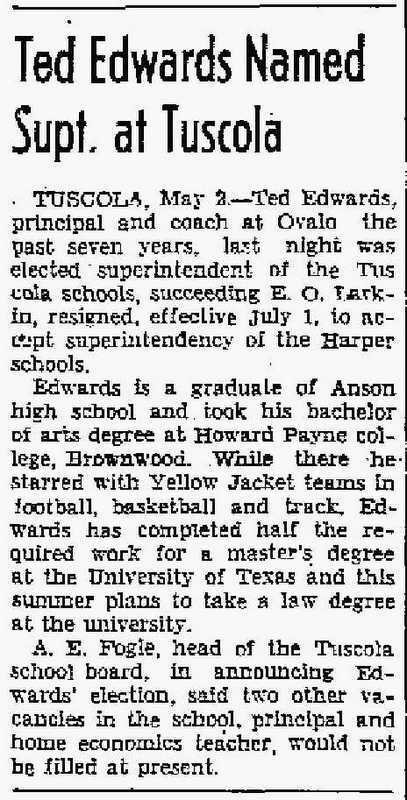 Ovalo Rural High School District Coach and Principal (1932-1939). Tuscola Independent School District Superintendent (1939-1945).